It’s a tough world out there – for everybody – not just Norm. Why do we find it so easy, in this “dog eat dog world,” just to pile on? Why can’t we find a way to lighten our neighbor’s load? Can we make it easier on our fellow travelers instead of hindering them? The writer of the book of Hebrews said it like this: “Let us think of ways to motivate one another to acts of love and good works.” This is a call for constructive creativity: Find a way to help people; encourage those you meet on the path; leave a few words or kind actions to hearten those around you. How different the world would be – how different most churches, workplaces, statehouses, Little League parks, and families would be – if the first thing that came out of our mouths was not a put-down but a lift-up; if we would raise spirits instead of step on hearts. How different the world would be if we pushed people to love and to do good, instead of inviting the constant flood of fury and vitriol that dominates our culture! This alternate way of living will not happen without intentionality. We will have to “motivate one another” as the Good Book says. Other translations of the text are more direct, using words like “provoke” and “spur.” The original word is paroxysm, a word transliterated directly into English (though I have never heard it used in an actual conversation). We can be that “break,” that place where people find help, uplift, encouragement, and the motivation to love and do good. In the words of Henri Frederic Amiel’s benediction, “Life is short, and we do not have much time to gladden the hearts of those who make the journey with us. 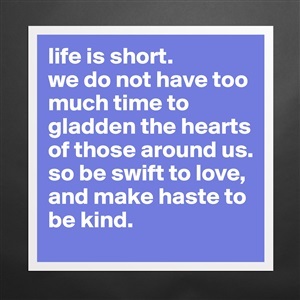 So be swift to love and make haste to be kind.” Amen. You are exactly where you need to be right now. Our lives on 30A would be so empty and shallow without your insight and spiritual guidance. You remind us of what is really importanot.
! Reblogged this on <a href="http://scotsirishpadre.